Tasmania’s population growth is fed by people who come here on holiday and like the look of the place, like the temperature, like the price of real estate and, often enough, like the prospect of growing their own food and being self-sufficient. Self-sufficiency is a big goal, seldom achieved, but Sharee McCammon and Graeme McCormack (“they call us the Macs”) have nailed it. They have a property of little more than 1.5 hectares that provides 90 per cent of what they eat – and they and their two young-adult sons are not vegetarians. The couple knew zilch about providing their own food when they moved here from inner Sydney in the early 1990s. But then they were not aiming that high. “We did not have a plan,” said Sharee. They both work part time at the University of Tasmania, a 40-minute commute from their home in the Pelverata Valley between Huonville and Cygnet. Sharee is the gardener and Graeme sees to building (including the house itself), fencing and firewood. She grows three different types of garlic, because they keep differently, about four different beans, several different beetroot and swedes, turnips, kohlrabi, sugar beet, celery, leeks, onions, shallots, asparagus, zucchini, tomatoes, capsicum and chillies. At the end of summer she will freeze 10kg of corn kernels and harvest basil by the 20kg bucket to be frozen for pesto. About 100 pumpkins are needed for a year-round supply. And here’s a garden tip: never plant more than one cucumber says Sharee, tired of picking more than a dozen a week. There are apple, pear, quince, plum, nectarine and peach trees; berries, melons and nuts. With friends they buy a couple of young pigs a year and fatten them up. “They can do the tractoring and dig up bracken to get a new garden ready,” said Sharee. They are killed, at home at 10-12 months old, when the meat has good flavour. “Eating your own meat is not easy, it’s so psychologically challenging,” said Sharee. The family eats meat a couple of times a week on average, but it fluctuates. “Just after we have killed a pig we have roast pork a lot,” said Sharee, perhaps accompanied by King Edward potatoes cooked in lard. They keep between eight and 50 chooks, mostly for eggs. “Rabbits are a much more efficient way of getting meat for us – we do not have to buy grains for them, they live off garden scraps,” she said. And there are goats for milk – much more practical than a cow because they will fit in the back of a car when they need to be taken to the buck to mate. Sharee makes about 80 cheeses a year, which she matures in a “cellar” underneath the kitchen floor. In her day job she manages a laboratory that uses research mice. The mice are transported in wide shallow plastic boxes. Sharee uses these to contain her maturing cheese. “I thought, if they keep mice in, they would also keep mice out,” she said. They also have two donkeys on the property, whose purpose is to provide “a bit of frivolity”. “I think lots of people are doing this around the place, although not everyone does it with the animals. You realise that’s why peasants lived like that – all the waste gets used to feed an animal and then the manure comes back to the garden. I just love the circularity of it all. 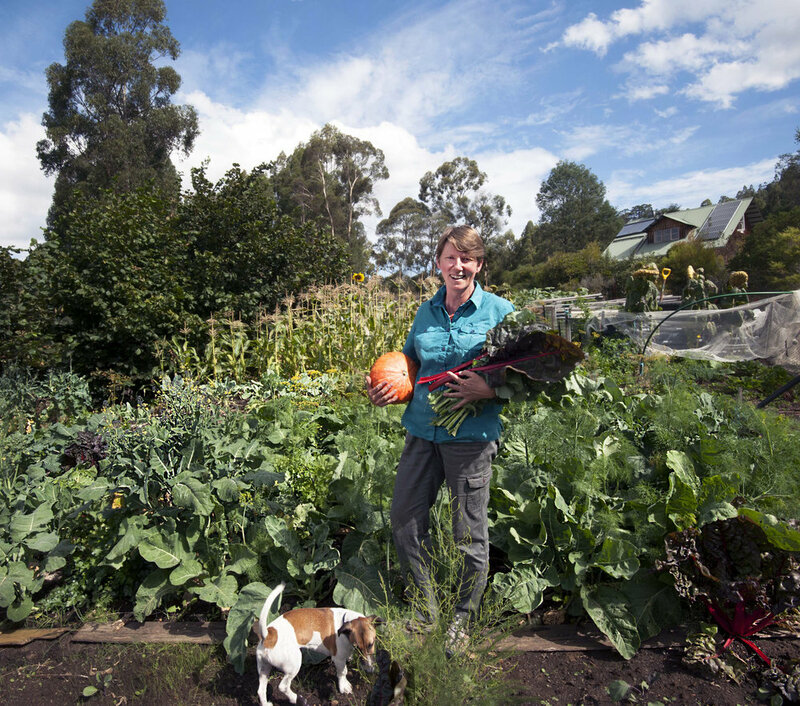 Spring famine – when the winter crops are done and the summer ones are yet to start – is her biggest challenge, and the time when the pantry and freezers come into play. It’s not good to run out of onions, you can have too much plum jam and Sharee “feels a bit of a failure” if she has to buy potatoes because her own crop has not covered the whole year. 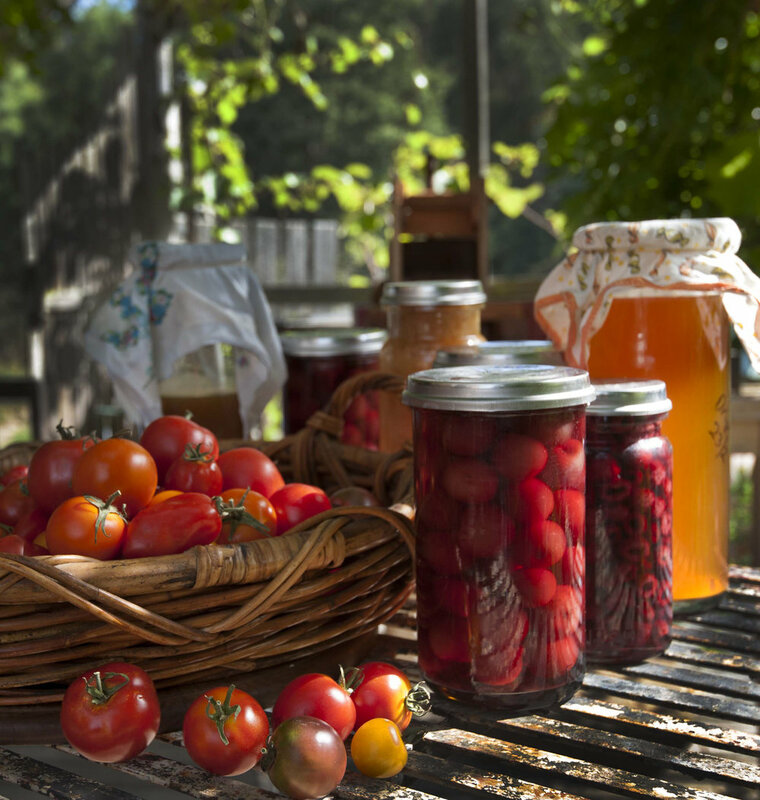 And you need a great deal of storage when you grow your own food. The walk-in pantry is completely lined with galvanised iron. On its shelves are sauces alphabetised according to category, preserves, jams, chutneys, packets of foods from the solar-powered dehydrator, onions and pumpkins and galvanised tin bins for the couple of items Sharee does shop for – flour and rice. This article is from A Table In The Valley, food stories and recipes from Tasmania’s Huon Valley, written by Elaine Reeves, recipes by Steve Cumper, and photography by Paul County and Nick Osborne. Available at good book stores from November. You probably know The Glover Prize as one of Australia’s most prestigious landscape art prizes. And you’re right. Established in 2004, it is awarded annually for the work judged the best contemporary landscape painting of Tasmania, with the winner taking home $50,000 and a bronze maquette of colonial artist, John Glover, whose legacy is celebrated through the prize. But the prize has become something so much more to the Tassie community and, in particular, to its home, Evandale. In a word: transformation. Over its 14-year history, the Glover has stirred some rather fabulous change. As soon as the event was introduced to Evandale in 2004, the community ardently jumped on-board, with locals welcoming the Prize with open arms. The community didn’t need any time to warm to the idea. Organisers were pleasantly gobsmacked to see people and traffic flooding the normally sleepy town of just 1,000 people. The first exhibition saw 2,500 people through the doors. In 2009, it was reported that 106,700 people visited Evandale – an average of 292 people per day. Each day of the Glover Prize, however, 1,550 people attended the Glover Prize exhibition – five times Evandale’s typical daily visitation. Attendance and popularity of the Glover Prize exhibition has consistently grown each year and is now recognised as a highlight of the Australian arts calendar – receiving national media attention as well as patronage of over 9,000 visitors for this year’s event. Perhaps the biggest drawcard for the Glover Prize is its venue. Held each year at the Falls Park Pavilion (home to the Evandale Market every other weekend of the year), it has the effect of stripping pretense and welcoming a broad spectrum of art enthusiasts. The Glover Prize has provided many Tasmanians with their very first interaction with a wide range of art, and not only by paying for a ticket and having a looksee. Volunteers and committee members work tirelessly each year to develop an exciting experience for Glover Prize visitors. The passion surrounding this art community has blossomed, telling a remarkable story of how community spirit has grown and fostered something that is nationally recognised and appreciated. The Glover Prize aims to explore the idea of ‘landscape’ art as defined in its broadest sense and encourages an ongoing conversation about what that might be. Art is a conversation and, at its core, expresses an idea as much as a visual form. The tradition of John Glover and the landscape is to depict, usually realistically, the picturesque scene in front of the artist. Today, however, contemporary visual artists tend to depict the psyche of the landscape – often from an individual artist’s point of view and experiences. This change is reflected in both the artworks featured in the Glover Prize and in the community’s understanding of ‘landscape’ art. The artworks that have entered and been exhibited in recent years are a lot more abstract, surreal, and expressive. This transformation of the community’s understanding of ‘landscape’ art is supported by the Glover Prize’s approach to including the next generation. The Glover Prize strongly believes in art education for school children, with over 1,000 attending the 2018 exhibition for free on specially developed education days during which time the exhibition is otherwise closed to the public. The Glover Prize began as a three-day event over the March long weekend. However, due to increased interest, it now spans the long weekend, the Tuesday, and the following weekend. The prize money awarded to the winner has also increased dramatically over the years, starting at $20,000 and incrementally increasing until it reached the $50,000 that is on offer in 2019. The Glover Prize has seen a broad range of artistic interpretations of the words ‘landscape’ and ‘Tasmania’. Entries and finalist artworks have continually branched out from the traditional view of a landscape into more abstract and surreal interpretations. This diverse and eclectic range of art is reflective of the increase in interest the Glover Prize has received from artists. Having received 75 entries in its first year, this number of entries has grown every year to more than 400 entries received in 2018. With so many inspiring changes happening in art communities both locally and nationally, it’s exciting to see how the Glover Prize will change and develop over the next decade. If there’s one thing that’s certain, though, it’s that the Evandale and Northern Tasmanian community will happily be coming along for the ride! The Glover Prize 2019 Exhibition commences on the March long-weekend, running from Saturday the 9th of March, 2019 and continuing until the end of the following weekend on Sunday the 17th of March, 2019, at the historic Falls Park Pavilion in Evandale. Think you have to travel to Palm Springs or Beaumaris to be surrounded by MCM design? Think again. Modernist buildings, bars, murals and landmarks are everywhere in Hobart. Spend a day exploring the city using this self-guided itinerary and you’ll know where to find them. Start things off with breakfast at Mona. Grab a coffee and croissant from the Museum Café and take a seat by the fireplace in the adjoining room (the one with all the curved stainless steel Arco lamps). This is the Courtyard House (1957), a classic mid-century modern home designed by celebrated architect Sir Roy Grounds for Claudio Alcorso, the founder of the original Moorilla site. The building now functions as the entrance to Mona, and Walshie has enclosed the 1950s courtyard, extended the crazy paving and sunk a hole in the centre of the floor for patrons to descend into his underground galleries. Once you’re down there, be sure to look up and try and spot the foundations of the original home and fireplace. You should also visit the Mona Library which is contained in an extension to the modernist Round House (1958) – another Grounds’ design. Since you’re already in the area, stop by the old Snows Dry Cleaners (1957) at 388 Main Road, Glenorchy. Designed by Tasmanian architect Esmond Dorney, you can see why he is credited for bringing MCM to our island – check out those glass walls and the butterfly roof. While many of Dorney’s famous buildings around Hobart are private homes, this one is fair game for a peek as, at the time of writing, it sits empty and up for lease (surely a prime candidate for a themed cocktail bar). Alternatively, if you would like to see the interior of Dorney’s greatest mid-mod house, the Hobart City Council now own the home that he built for his family on Porter Hill (1978) and have made it available for public bookings such as workshops, events, performances and general public visitation. Search for Dorney House on the City of Hobart website – you will be enamoured with its sunken lounge, floor-to-ceiling windows and petal-shaped roofline. Lunch is best consumed at The Salty Dog Hotel, a refurbished 1970s beachside motel in Kingston. Any purists out there might object to the pub’s inclusion in this guide, arguing that the playful kitschy feel is not technically modernist, but I point you in the direction of the mid-century timber bar in the front space, the light box in the hallway featuring a locally-owned 1968 Mk1 Ford Capri and the pastel hues throughout that reek of the post-war period. The pub redesign was completed by Danielle Brustman and Michelle Boyde (Brustman + Boyde) in collaboration with Pippa Dickson, one of the hotel’s owners. On your way back to town, drive via Taroona to witness another Esmond Dorney masterpiece, the Saint Pius X Catholic Church (1958). Credited as being Australia’s first modernist church, the building’s lightweight tubular frame and corrugated iron barrel vaulted roof is trademark Dorney for its use of economical materials and curved structures. The design is simple, clean and functional. We’re now moving into Dirk Bolt territory. Bolt designed many mid-20th century buildings in Hobart, including the 10 Murray Street office block that was demolished this year, but one of the finest examples of his work still stands at the University of Tasmania’s Sandy Bay campus. Christ College (1959) features breeze blocks and bare concrete walls, the latter making it a variant of post-war modernism known as brutalism. This style can also be seen in the abstract illustrations cast in to concrete panels at his Long Beach Bathing Pavilion in Sandy Bay (1962). Pop in to Wrest Point (1973), another Roy Grounds design, and head straight to the Bird Cage Bar. The colourful frescos were painted in the 1970s by Charles Billich and provide the perfect backdrop for an afternoon tipple (interesting side note: the frescos were discovered behind a false wall during recent renovations to the bar which is why they can still be found in their original, untouched glory). Patterned carpet, vinyl booths, retro cocktail chairs and a view to the casino’s tropical inspired garden (complete with mini waterfall) make this bar the real deal, even if it is pushing the bounds of what some consider modernism. Before you leave, seek out the stunning 16 metre tall ceramic mural by Vladimir Tichy at the back of the hotel. Many of Tichy’s works have been destroyed around Australia but this one remains in pristine condition. And on your drive back to the city, do yourself a favour and keep an eye out for the ABC Glass Mosaic Mural (1960) on Sandy Bay Road by George Davis. It has modernism stamped all over it. By now you’re probably experiencing an overwhelming urge to take a little bit of mid-century modern home with you. The solution is at Antiques to Retro (128 Bathurst Street, Hobart). They stock MCM bar carts and sideboards, a huge range of West German vases and other kinds of furniture that will appeal to your love of clean lines and organic shapes. If you can pull yourself away from all the pretty things, go for a short stroll to Construction House (1956) at 116 Bathurst Street. This office building is a modernist gem, not least because of the ceramic tile façade by Tasmanian artist Max Angus and the five-storey Ficus elastica (what your mum would call a rubber plant) growing through the terrazzo stairwell. Pure mid-century magic. Next up, head to the Cat and Fiddle Arcade (1962) to see the mall's namesake play out the classic nursery rhyme, which it does every day on the hour from 8am to 11pm. To the clock’s detriment, the arcade has been updated many times over the years leaving the 60s typeface, starburst style clock and giant mechanical cat looking slightly out of place. If you’d like to see the clock in its original context, search for ‘Life in Australia: Hobart’ on YouTube and skip to 11:46. The video, from the National Film and Sound Archives, is an amazing watch from start to finish in its own right. We’ve saved the best until last – one of Hobart’s most iconic 20th century landmarks, the Railway Roundabout (1962). Located at the top of Liverpool Street on the Brooker Highway, the roundabout is notable for the hyper-modern UFO fountain at its centre designed by three workers from the Hobart Cadbury Factory. The space age structure was so groundbreaking in the 1960s that it appeared on postcards and must-see lists for visitors from around Tasmania and interstate. In this way, not much has changed, as the mid-century roundabout is a must-see in our books too. Lume Magazine is published by Foundry, Tasmania's new education pathway.